First of all we need to consider what was found. In 2013 cave explorers found a large number of bones deep in the Rising Star cave system in South Africa. Anthropologist Lee Berger then recruited a team of scientists with caving experience to excavate over 1500 bones and teeth. The bones were eventually classified as Homo naledi and presented to the world in September 2015 as a new “hominin” or “early human”, i.e. some kind of pre-human creature that is no longer an ape, but is not fully human. This received wide media coverage with the publishing of a photo showing an almost complete skeleton surrounded by hundreds of bones, bone fragments and teeth. The discovery has been hailed by popular media, and in schools and colleges, as more evidence for the evolution of apes into humans. However what was actually found is not as clear-cut as reported in the popular media. Let’s compare the original photo of the bones and teeth as published in the online scientific journal eLife and in many of the media reports, and then add comments from the original authors that have rarely made it to the public, along with our analysis of the original data. Note carefully: the authors of the original report of these specimens admit the skeleton layout is not one individual. In fact, they claim in their report that the collection of bones and teeth represents at least 15 individuals. The answer is: a large collection of bones and teeth from a large number of separate individuals. Apart from the small hand and foot bones, most of them are damaged or eroded. Many of the bones are incomplete, and there is not one whole skull or intact cranium. Which means without one intact whole skeleton as a reference point, there is no evidence these bones all belong to the one species. Are the bones evidence for ape to human evolution? First of all, a general principle: A fossil is evidence that a creature has died and been buried in an environment that has preserved all or part of its structure, e.g. bones, or left an impression in the surrounding rock, e.g. skin imprints or tracks. Fossils are promoted as evidence for evolution only when you fit them into an evolutionary tree of life you already believe in, and thus into an evolutionary timetable. Fossils per se by themselves are never evidence for evolution, and the comments below on the age of these finds by one of the original H. naledi research team and other researchers brings this out well. Australopithecines were apes. The most famous of these is “Lucy”, and although they are often portrayed as “human ancestors” their name means “southern ape”. A less well known austropthecine named Australopithecus sediba was found in the same region as the H. naledi bones, and as its name states, A. sediba was definitely an ape. The reason for comments like those of Stringer and Schwartz is that the bones seem to show a curious mixture of ape and human features. Most of the bones are ape-like. The estimated brain size is between 465cc and 560cc, about the same as a gorilla, and in the same range as estimates for austrolopithecines. The teeth are small and jawbone is smaller and lighter than an ape jaw. The jaw bones were not attached to the crania. The shoulders and hips are ape-like, but the wrists, hands and feet are human-like, although the fingers are more curved that human fingers. Because none of the long limb bones are intact, and whole skeleton is from a mix of individuals it is impossible to get and accurate measurement of limb and body proportions – an important distinguishing factor between humans and apes. Much to the frustration of evolutionary anthropologists, the bones have not been dated, so they cannot be fitted into any evolutionary timetable. So it seems that even if they or surrounding materials were subjected to radiometric dating that would not prove anything. It is good to see an evolutionist admit to what creationists have been saying for many years about dating methods. Our comment on Ward’s statement is that “more species diversity” could simply mean more species of apes than there are now, but that would be no surprise, as we know that many apes have become extinct, just as have many other kinds of animals. That does not mean they evolved into people or ape-men. It simply means they died out. Is it a burial site? The research team suggest the “hominins” had deliberately buried their dead in the cave, in a similar way to a collection of Neanderthal skeletons known as the “pit of bones” in Spain. Deliberate burial of the dead is considered to be a human characteristic, and this has been used as evidence that the bones represent evolving pre-humans rather than apes. However, one of the most mysterious aspects of the discovery is that the bones were deep in a cave that is almost inaccessible. The bones and teeth were at the narrow, far end of an extensive cave system linked by narrow passages and steep drops, as seen in this diagram of the cave system. 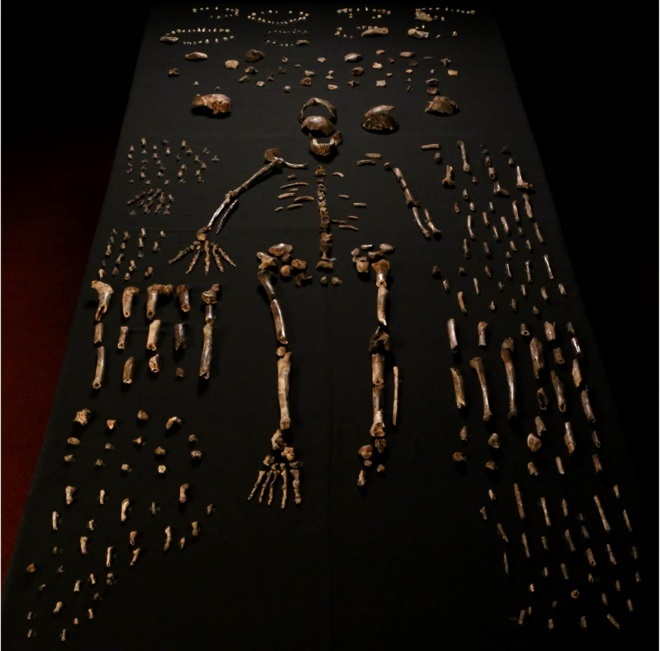 This meant that as well as having technical qualifications in both cave exploration and fossil digging, the team who excavated the H. naledi specimens had to be small and thin in physique in order to even access the bone cave. Also, as noted above, there are no whole skeletons and no intact skulls, so formal burial of the dead is not likely. Since in some cultures ape and monkey brains are considered a delicacy, the broken skulls could be the result of humans deliberately breaking the skulls open in order the get the brains out for food, and then discarding the remains into the cave system where they were washed to their current location, and mixed and further broken as this happened. But the most telling argument is that the almost inaccessible location goes against anybody going to the trouble of using it as a ritual burial site. It is more likely the bones were washed in, and the inflow of water and sediment mixed bones of different species. The bones were not embedded in rock or mineralised like many fossils, but were in “largely unconsolidated mud-rich sediments” in the base of the cave. The presence of so many disjointed bones from what may well prove to be several species in a limestone cave system fits with the bones being washed in during cave flooding. So there we have it: a large, but motley and somewhat battered collection of bones and teeth with a mixture of characteristics, and which have yet to be tested by standard, but unreliable, dating methods are certainly no evidence for evolution. If they turn out to be a mix of human and ape bones, that would also prove nothing. Humans and apes live together today, but neither shows any evidence of evolving from one to the other. It is our assessment, based on the released data, that the curious mixture of ape and human characteristics is better explained by the bones being a mix of human and ape bones that were washed into a cave, rather than an evolved ape in the process of turning into a pre-human being. Reproduced under the terms of the Creative Commons Attribution License, which permits unrestricted use and redistribution provided that the original author and source are credited.